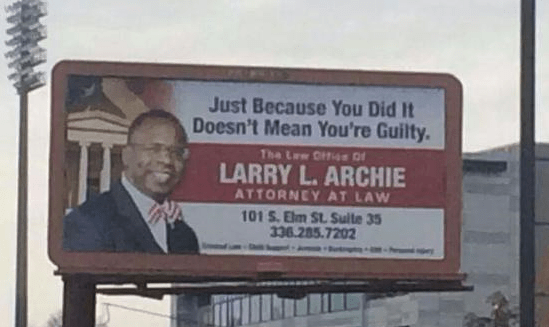 This is of course true in a couple of different ways (depending mostly on the meaning of "did it"), but it still seems to be a little jarring for people to see it on a billboard. Larry Archie is an attorney in Greensboro, North Carolina, but I don't know how current this picture is (though it's been making the rounds lately). It could be out of date, because the current website instead uses the slogan, "When You Need Justice, You Need Just Us." Frankly, I like the other one better.